It was a sunny day in June. The weather was warm enough to walk around outside without a jacket. The tumultuous weather in Illinois is something else, which is why it felt good to be bare-armed in the breeze. She walked with her head down, staring at her feet as she took her slow and steady steps, one foot in front of the other. In her ears played a Spanish song about leaving; leaving and never coming back and that’s exactly what she wanted to do. What am I doing? she constantly asked herself. This is was not where I want to be. Since she was a little girl, she loved the swings. It was a place of refuge, a place to be free and to get away from the world. As a child, it was time with her dad who pushed her high enough to kick the leaves on the tree in front of her. In grammar school it brought about the swinging competitions; who could swing higher then who was brave enough to jump off. In high school it was a stress reliever, where she and her friends would go to feel like children again and now, it was the only place where she could feel at peace among the mess that she had found herself in. Graduated, no job and scraping the bottom of the lowest low in her life. Running away seemed to be the only answer, yet at the moment, the swing set seemed to be the only relief. She walked to the park closest to where she lived. Slowly but surely she made her way there. Beneath a tree, there were two people sitting at a picnic table; a man and a woman. She sat on a swing and the song played on repeat in her ears. She felt sad. The look on her 23-year-old face must have said more than words could at that point. She looked at the tree as she swung. When the song from her iPod stopped playing just to repeat itself, she realized that the swing she chose to sit on was quite possibly the noisiest one. 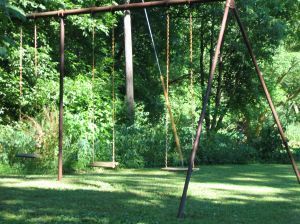 The rust on the swing made it whine like a dying cat, or so she thought. She decided to peel herself off the swing because she didn’t want to bother the people sitting under the tree with the sound of the swing. She walked to a black bench and sat down to admire the greenery and in an attempt to calm her mind and the million things running through it. With her ear buds still in her ears, she pulled out a book to read about something that didn’t have to do with her life. She couldn’t take reality any more. As she looked down to stick her nose in her book, she noticed a shadow and a man mouthing words to her. She put her book down and removed her ear buds. It was the man who was sitting at the picnic table. “Excuse me,” said the balding older man. “I’m sorry to bother you, but I just wanted to say that I couldn’t help but watch you on the swing. You looked beautiful.” She looked at this man and didn’t know what to say. He wore a white shirt, khaki shorts and running shoes with white tube socks. She said thank you. “You reminded me of my daughter,” he continued. “I used to push her on the swings and she loved it. But I lost her about 23 years ago.” As she looked up at him, the sky a bright blue behind his balding head, she could only say, “Oh.” He looked back at the woman at the picnic table. “Anyway, I just had to come over and tell you that. Sorry to bother you again,” he said as he turned and walked back to the table. “No bother,” said the girl. All of a sudden, she felt overwhelmed. She felt strangely safe and strangely loved. There was hope and love and meaningful loss in the world. She didn’t know his story but her swinging reminded him of what she remembered as a child. It was the most comforting, yet distant source of security. After he sat at the table with the woman, she noticed that he didn’t look her way again. Instead, she felt the need to go home and take a nap. Oddly enough, she had found what she was looking for. Previous Infographics are cool. Check this out. Next You’re friends with your family on Facebook?